Design NJ was pleased to be a media sponsor of the ASID show (officially, The 2018 ASID NJ Design Symposium & Industry Trade Show) once again. For the second year in a row, the show was held at the Liberty Science Center in Jersey City—a fabulous venue for a wonderful event. There’s always so much to see and do at this event; here are a few of our edifying discoveries. 1. The right lighting cannot be underestimated. We’re design people. We know that selecting the right residential lighting is important for practical and aesthetic purposes. But it can also transform a professional venue from dull to dynamic. 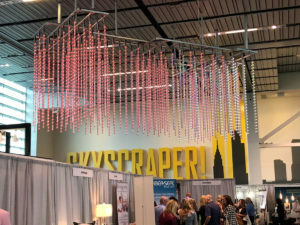 Look how this cool fixture fills up the cavernous space above the show floor. It’s sort of science-adjacent in that it’s got a certain molecular-type string vibe (I think? ), so it’s fitting for the venue. And for us non-scientists, the multi-colored lights are just pretty. The lighting was eye-catching without being obtrusive. 2. It’s vital that humans interact with nature. 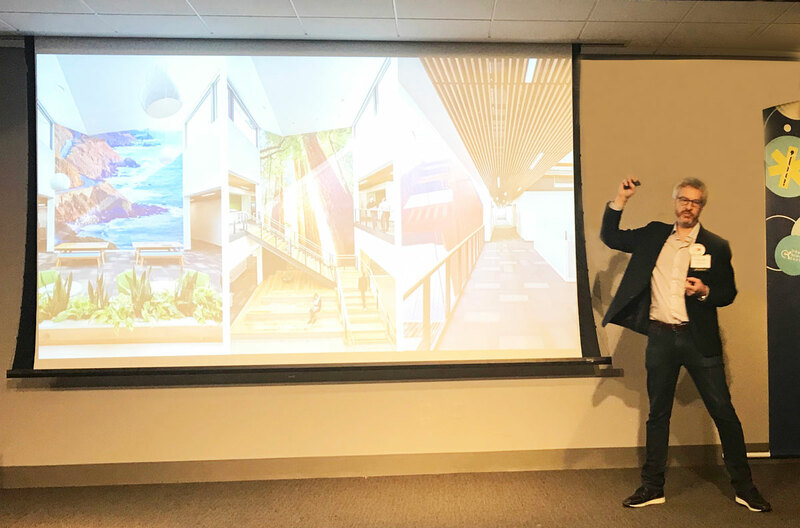 Editor in Chief Ren Miller attended the symposium “Biophilia, Wellness and the Visual Environment,” sponsored by Steelcase and presented by David Siegel, director of Surface Imaging at Designtex. Siegel explained the importance of interiors that maintain a connection with the outdoor environment. In short, our sealed-up buildings are stressing us out. Siegel was a lively speaker. 3. The showers in my home are lacking. I sat in on “The Latest in Shower Design and Technology” conference presented by Gina Previte and Bernard Schrum from Moen. 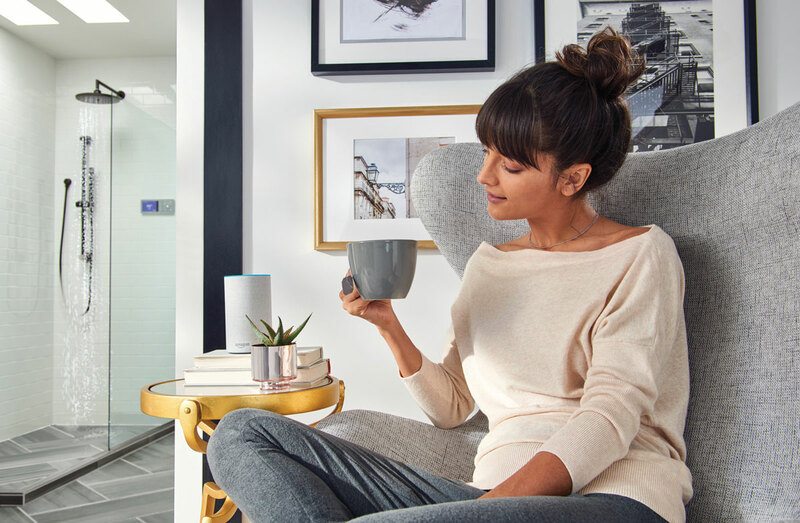 They discussed the newest shower innovations; and now I need to have Alexa pre-heat my shower to just the right temperature. 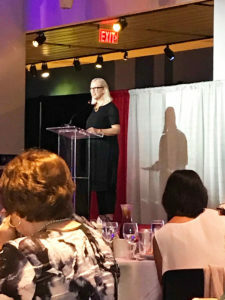 The keynote speaker was Ghislaine Vinas who discussed “Creating Happiness.” Her interior designs include lots of color, as well as fun, kitschy elements. She is enthusiastic and energetic, and it was delightful to hear her speak. Don’t let the black outfit fool you. Ghislaine Vinas loves color. 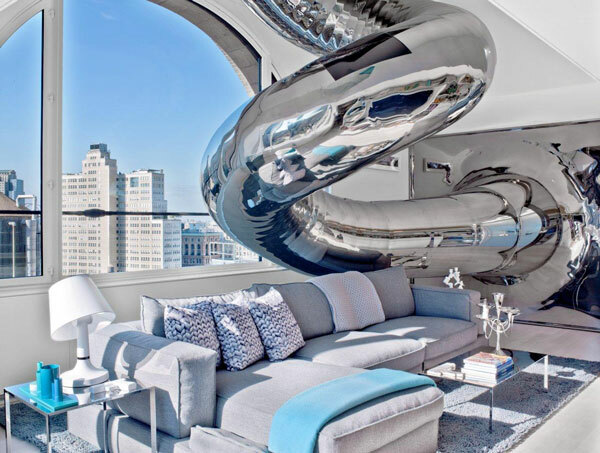 She likes to include quirky, unexpected features such as a slide from second floor to first in a sophisticated Manhattan apartment. 5. An acoustically healthy environment is all about the ABCs. 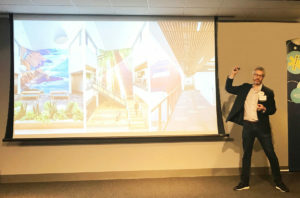 Associate Editor Meg Fox attended the “Speech Privacy and Sound Masking” session led by Elke Merz, Architectural Solutions Consultant with Steelcase, Inc. Merz described effective ways to control sound—Absorb, Block and Cover. All three areas need to be considered in order to create an acoustical environment free from distractions. 6. A bit of swag is always fun. Meg called that round jar-opener a “rubber husband.” I’d never heard one of those called that before, but from this day forward, I’m never going to call them anything else. 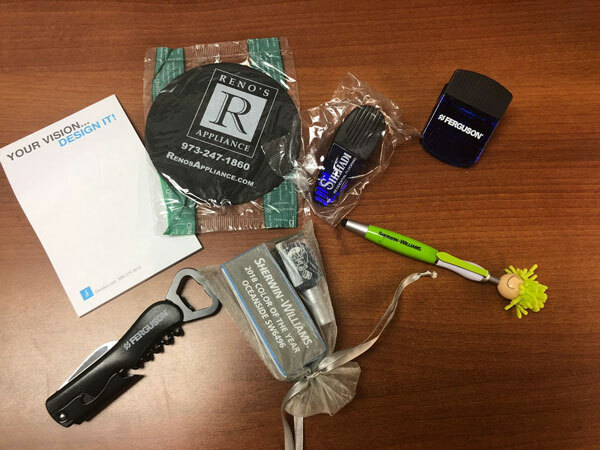 Giveaways from Duralee, Reno’s Appliance, Shehadi, Ferguson and Sherwin-Williams. 7. Some species of parrots can live as long as 80 years. 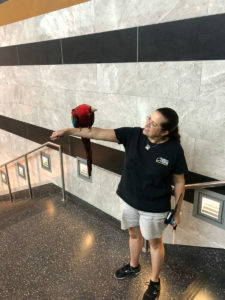 This parrot and his human friend were there to greet us with interesting facts about our feathered friends; I thought that was a nice touch. 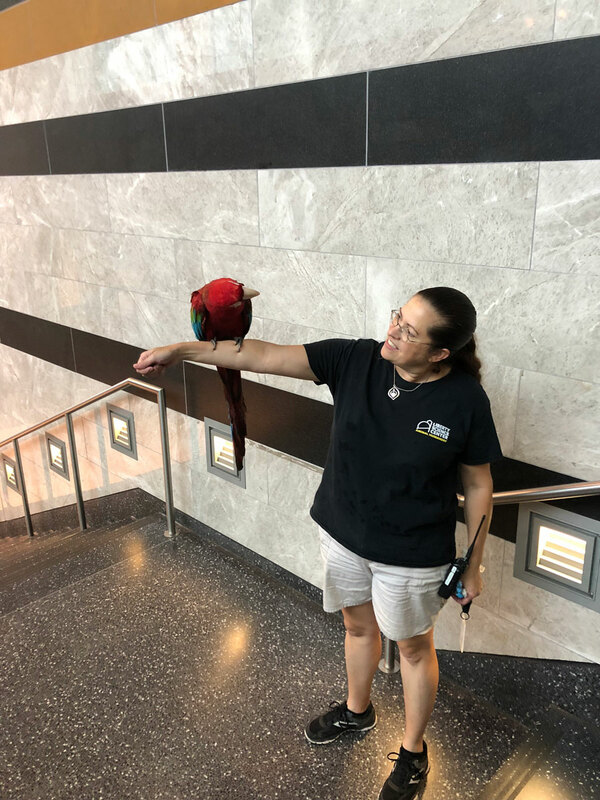 This is Heidi S. from the Liberty Science Center staff, and Mickey. Mickey is a (ahem) spring chicken at only 37 years old.